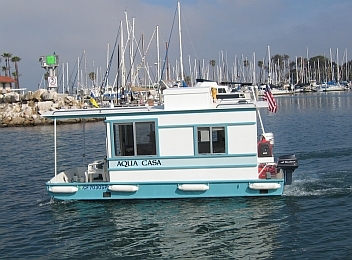 Aqua Casa Houseboat, The Boat of Your Dreams! 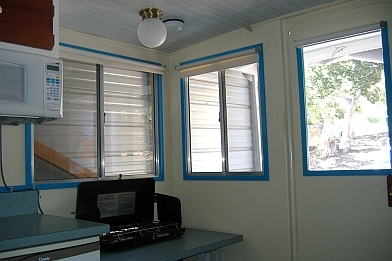 Our Aqua Casa Houseboat is the result of years of boat design and building experience. These boats can be built by the amateur builder with little or no boat-building experience. The are fully trailerable. This boat can double as a self-contained travel trailer, which you can use for any purpose, whether it is a weekend getaway or an extended trip on the road. The Aqua Casas are easy to transport anywhere that you can take your tow vehicle. 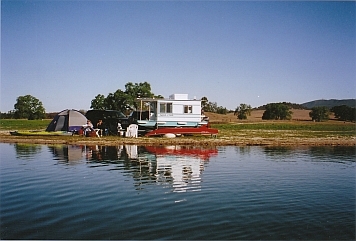 You can camp in a campground or sleep on the lake! This boat gives you great versatility! You will find a complete galley, a bright and airy cabin, full headroom, plenty of storage and storage space, complete with RV appliances, a private enclosed head, a fold-out bed, and inside or outside helm. 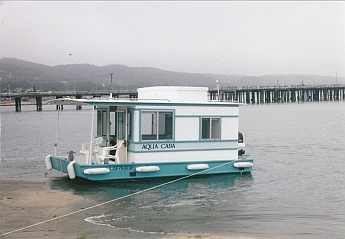 The Aqua Casa houseboat comes in a 16 foot model or a 20 foot model. Photos are of the 16 foot. 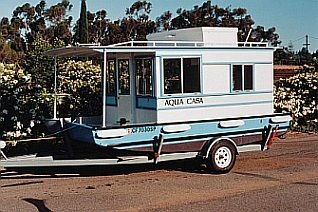 There is a scan below of the spec sheet for the 20 foot Aqua Casa houseboat. These houseboats easily carry 2-6 people. They can be outfitted with a 3 to 30 HP outboard motor. These boats cost about $3,500 to build, excluding motor, trailer and controls. 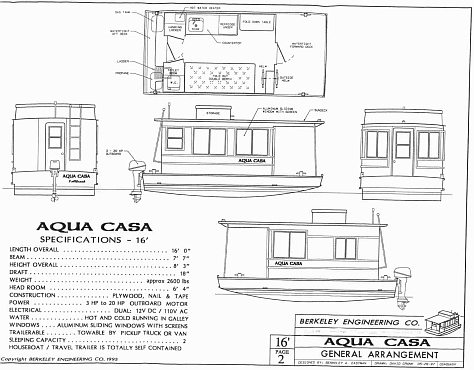 The Aqua Casa 16 depicted on these pages was built by Berkeley Eastman and now belongs to Bruce and Bridget Eastman, of Prunedale, California. 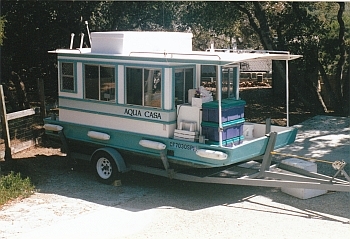 The next set of photos of our Aqua Casa will show you how versatile this boat is. It can be used as a boat or as a camper. I have also attached a photo or 2 of the boat on it's trailer. I hope that you enjoy them! Below you will find 3 interior photos of the Aqua Casa 16. 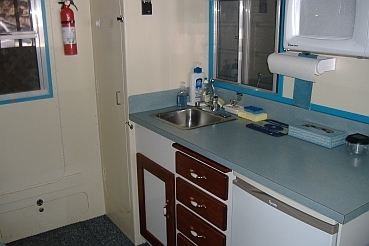 The photos are of the galley, the cooktop that the Eastmans use, and the sleeping area. This is the specification sheet on the Aqua Casa 16. If you right-click on this image and save it to your computer, you can enlarge it to be able to see it better. This is another photo of our Aqua Casa 16 foot version. You can see her interesting lines and her character! 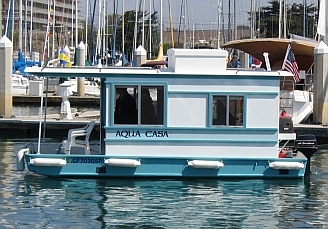 The Aqua Casa 20 is a larger version of the 16 foot boat. It has more spacious cabin room, and all of the features of the 16 foot version. 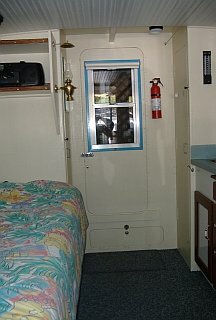 The controls are also accessible from inside or outside the cabin. The 20 foot boat has room for a small dinette set. You may right-click with your mouse on this image and save it to your computer. After doing that, you will be able to blow it up larger to see the details. This boat is easily trailerable and simple to launch, just like it's smaller counterpart! 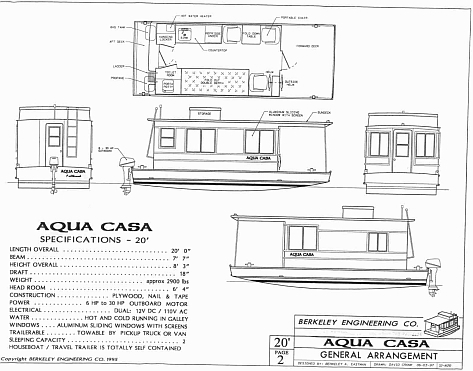 «If you are having trouble deciding which Aqua Casa houseboat plans to order, simply click on Order Page and think about ordering our Houseboat Information Packet. This information is complete, and will tell you the specs, the materials needed, and has additional pictures. You may ALSO use the same link to IMMEDIATELY place your order for your set of plans for the Aqua Casa 16 foot or the Aqua Casa 20 foot!